AFC - 06/25/04 Families at the Seaside, Dogs in the Streets, Again?! Third year in the row, in cooperation with City Department for Agriculture and Forestry, Animal Friends leads educative campaign for protection of companion animals before oncoming holidays. As a result of neglect of their holders, every year during summer holidays city streets are swamped with abandoned animals. Those hungry and thirsty animals wonder around and often wind up ran over and killed. The campaign "unofficially" already runs for awhile; leaflets are printed and distributed on our info stands and we more frequently receive phone calls about abandoned dogs, but the campaign is still hotting up! As a part of campaign on May 25, 2004, a lecture on the subject of relationship between man and a dog will take place in club Mama. Mr. Damir Kranjac, worker in Control Service of Nature Park Medvednica, will be talking about the reasons and criteria by which people choose particular breeds of dog, about the canine psychology and temper, the most common mistakes in raising, teaching and socializing of dogs, and other similar topics. 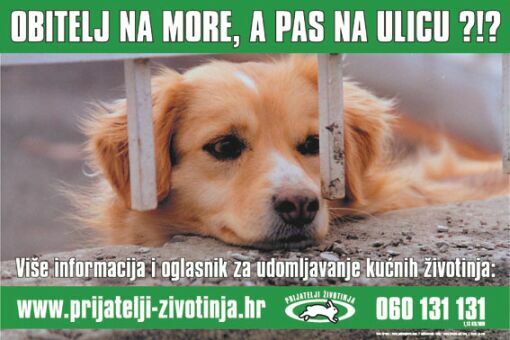 As a part of this campaign, Animal Friends will, via web site, also be helping in re-homing of dogs placed in animal shelter Dumovec www.zagreb.hr/Skloniste.nsf. Some of the photos from Dumovec shelter will be placed on our web site classified ad as well. Up to September, gigantic billboard will be set in Savska cesta, by Cibona Tower, warning the dog holders not to think only about their own fun when planning summer holidays, but to also take care of their four-legged family members. Dogs can be temporary placed in dog hotels, with friends or relatives, or permanently placed with someone willing to have a dog. The summer heats are on their way, so we appeal to citizens to provide bowls with food and fresh water to their own animals, and ones that live in their yards or wonder around neighborhood. We hope that proposal for the new Animal Welfare Act made by Animal Friends will be passed. It will be discussed in Parliament some time in September. New act should introduce better standards of animal treatment and impose greater punishments, so we hope it'll make people act more responsible to their animal family members.